Have I mentioned my love for books? It’s true; I am an unrepentant bibliophile. If they didn’t take up so much room, cost money, and make me feel as though a quick escape would never be possible, I would line each and every wall with built-in bookshelves and fill them joyfully. I have a special fondness for used books. I like it when they appear (but don’t necessarily smell) old, when there’s some evidence (admittedly not TOO much) that they’ve been appreciated. If they are second hand cookbooks, I love it when they automatically open to a page every time. You know you’ve found a good recipe when the book is accustomed to being open to that specific page. 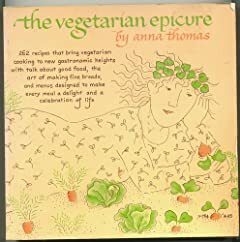 In my recent book swapping treasures, I’ve received this classic number, The Vegetarian Epicure . My edition dates from 1972, has a previous owner’s signature on the cover page, and bears an illustration on the cover of blissful plant-strong folks eating lovely veggies straight out of the ground. I couldn’t find the recipe for that, but this book DID open right to Mixed Grain Bread. Given our propensity for soup over here, I don’t imagine that you’ll be surprised that we have an even stronger leaning toward home baked bread. I should confess that I sometimes make soup just so that I have a good excuse to make and consume large quantities of warm homemade bread. Warm homemade bread also goes a long way in convincing the awesome twosome to give whatever soup I’m ladling up a decent try. There is always the bread dunking approach when one is truly reluctant you see. And so an auto open to Mixed Grain Bread is just a little too good to pass up for me. I made a few changes to the recipe – to eliminate the moo for me, and to accommodate my more limited pantry. While I would love to keep every possible type of flour and grain on hand, I find that when they become too crowded, one inevitably shifts to the back or the bottom, gets forgotten and unused and eventually spoiled by some unpleasant interaction with an uninvited pest. Thus, I don’t keep many different types of flour, although having now tested this recipe, I may concede to Ms. Thomas’ original (who, me?) and spring for some rye flour next time. The bread is delicious, and more importantly, it is easy. Yes, it is yeast bread, and it’s still easy. What’s to lose? Know what you get if your bread doesn’t work? Really, really dense bread. Can I tell you something? Even really dense homemade bread is delicious – just be sure to eat less of it. 😉 C’Mon. Give it a try. You’ll be glad you baked. 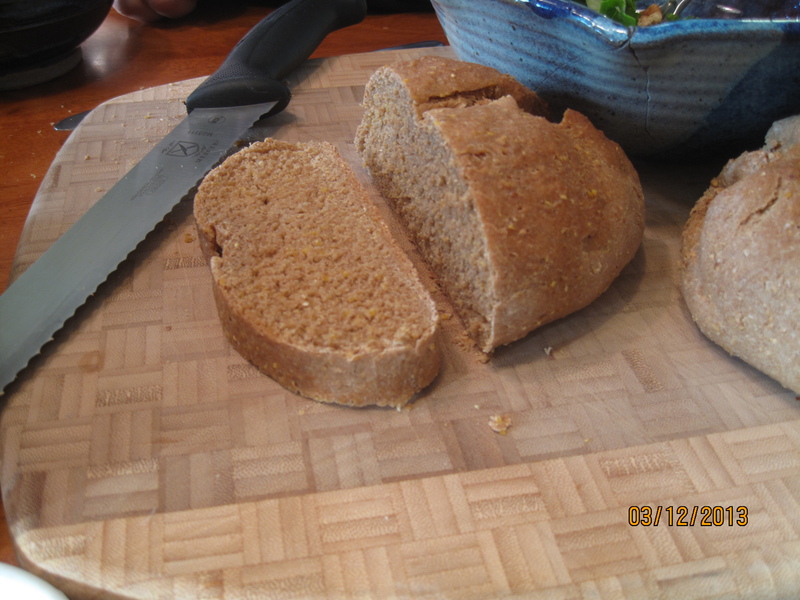 Mixed Grain Bread – adapted from Anna Thomas’ in The Vegetarian Epicure, p. 39. Stir boiling water, salt, 2 T olive oil and molasses in large mixing bowl (or in bowl of stand mixer). Stir in corn meal and oats and let this mixture sit for AT LEAST 10 minutes. You’re going for lukewarm – too warm and you’ll kill the yeast later – but no pressure, and remember dense bread is still yummy. 😉 While the grains are cooling, dissolve the yeast into the warm water. 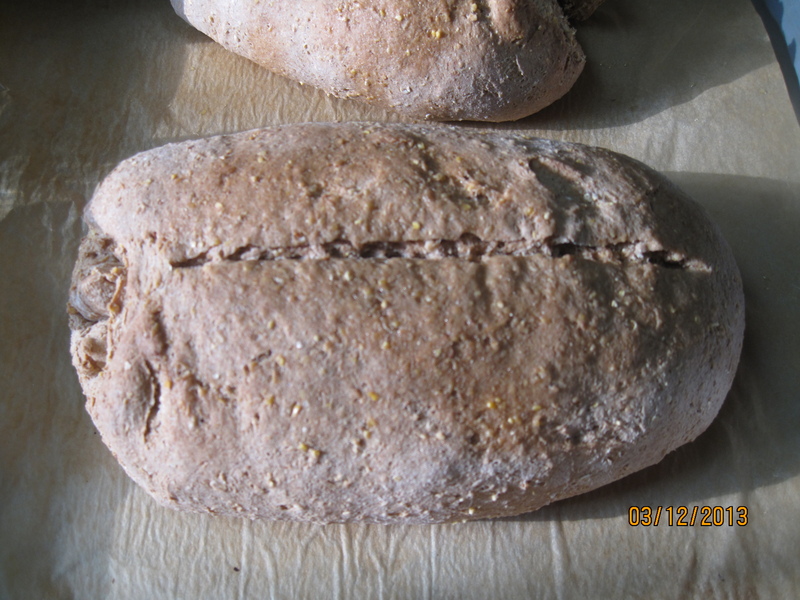 Let sit while grains are cooling and then add yeasty water to grains. Stir in the whole wheat flour. Add the white whole wheat by 1/4 c measures until the dough becomes stiff and cohesive (tacky but not sticky or gooey). If using a stand mixer, use the dough hook to knead the dough for at least 5 minutes. If kneading by hand, turn dough out onto lightly floured surface and knead for at least 5 minutes. If the dough becomes too sticky, add more flour. After at least five minutes of kneading, dough should be smooth and stretchy to the touch. Form a ball and place it in a large, oiled bowl. Turn the dough over so that it is oiled on all sides. Cover the bowl with a towel and leave it in a warm place to rise until doubled (around 1 1/2 hours). I’m no artiste, but funny looking loaves still taste great. When the dough has doubled, punch it down and form it into two loaves. 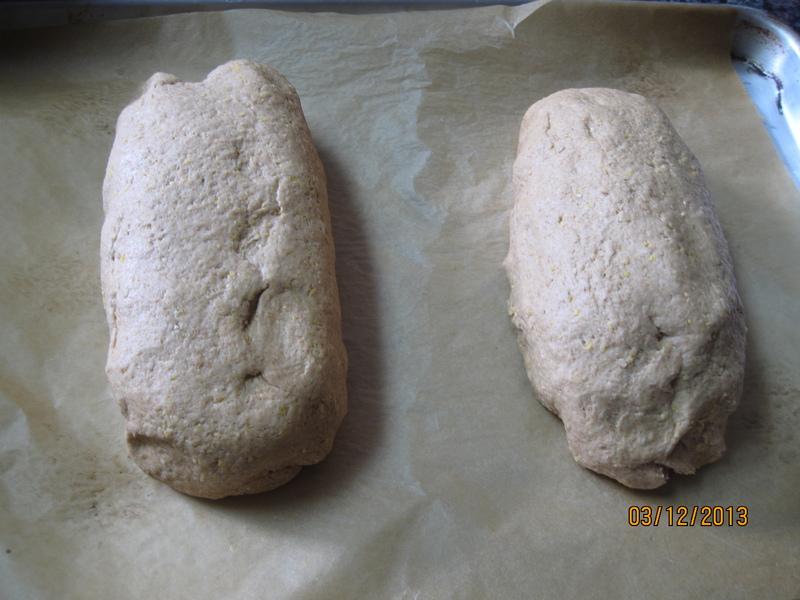 Place loaves on a baking sheet that has been oiled or lined with parchment paper. Preheat oven to 375 degrees. Let the loaves rise for about another 1/2 hour (until they’ve almost doubled). Just before putting bread in oven, slice down the middle with a sharp knife – just breaking the skin of the dough, not cutting the loaf into pieces. Bake in hot oven on middle rack for about 45 minutes. About half way through, brush the loaves with the reserved olive oil to encourage browning and olive oil goodness. You needn’t use it all if it doesn’t make sense – my measurement on this part was not measuring spoon aided. Remove from oven when the crust feels firm and is slightly browned. Allow to cool on a wire rack for at least 15 minutes prior to slicing and devouring. Don’t assume people have a plan; they may be waiting for you to tell them the plan! Oooh. That volunteer position sounds like a total score. And this bread is perfect for a warm munching with a good book. Thanks so much for stopping by Lynn! Isn’t it great? So cozy. I’ve got that book!! I bought it so many years ago – way before I was vegetarian, let alone vegan. The spine is cracked and the cover faded. Gosh, now I’ve got to go get it and look through it. The bread looks scrumptious (carb junkie here). Isn’t it a lovely book? I’m poking my way through it and I love the absolutely unafraid of looking like hippie vegetarian food vibe. Derr, I have Vegetarian Epicure: Book Two. Like the look of this one – specially the cornmeal. Maybe some walnuts or sunflower seeds as well? I made bread last week and I the last time I made it, was 15 years ago. I will give your recipe a try and thanks for posting. It’s nice and easy. And so satisfying! LOVE homemade bread but have never taken the plunge to try it myself! THANKS so much for sharing your recipe! You can do it Kristine! Thanks Jackie! We’ll check it out! It is really lovely bread and the original recipe calls for either honey or molasses. I was intrigued by the molasses angle…. Yum. Thanks for the invite Heather. We’ll check it out! Thanks for the pin Becca. It was super yum. ….maybe…. My mom did give me my love for all things veggie, but we had plenty of junk food in the house. 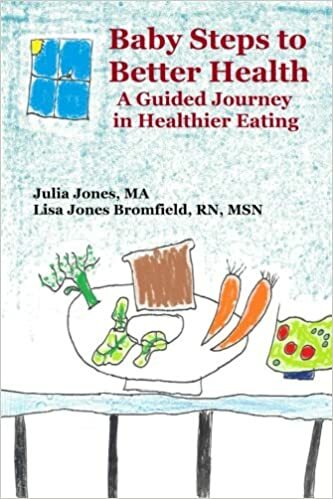 That book fueled my first foray into vegetarianism when I was a teenager. I thought it was fascinating. Lovely & appetizing looking breads: yummm! Let us know how you like it Krista! Thanks for stopping by. What a great Bread Recipe, can’t wait to try it! Thank you so much for sharing this awesome recipe with Full Plate Thursday and have a great weekend! I’m always up for another vegetarian cookbook, I’ll be on the lookout for it in our second hand stores. Thanks for linking up to Sharing Creative Ideas! Our pleasure Joey. Thanks so much for stopping by! Thanks Paula – for the pin and the nice compliment! Sounds so good! Thanks for sharing this on The Creative HomeAcre Hop! Sounds like a perfect day, right? I could use one like that this week! Thanks for stopping by Adelina! I am making ham soup and this recipe would go well with it. Thanks for sharing at Saturday Dishes. I hope you’ll return next week when we feature strawberries. This bread is so delish – I do hope you enjoyed it – and thanks for the invite! It is really delicious Diana! Thanks for stopping by! What a great mix of grains. I was really surprised by the cornmeal. I have to pin this one to make. Thanks Christie! The corn meal was what drew me in as well. Really yummy and so much great texture! Thanks for the pin and for stopping by! nothing better than fresh homemade bread! Can’t wait to give your recipe a try. I’m featuring you at Thursday’s Treasures, can’t wait to see what you share next! Thanks so much for the feature friend – and for hosting! This really is a great one – and so little effort. Can’t beat that! My husband gave me Volume 2 of that cookbook and I love it. Its awesome to see someone discover the first volume and love it just as much! It’s such a lovely book. So many great things to try and I love the handwritten feel of it. Can’t wait to try this! We are getting ready to harvest our first wheat crop and I need a good wheat bread recipe…thanks for posting! Ooooooh. Fresh wheat sounds divine! let us know if you give it a try! I love used cookbooks, too. I recently got a bread machine. Do you have any suggestions for how to make this in one? I’d love to try that! Honestly I’ve not had a lot of experience with bread machines, although my understanding is that most of them sort of have a formula that applies to when you put which kinds of ingredients in. If yours came with a manual you might be able to find that kind of guidance. If you don’t have the manual any more, you might be able to find it on line. Wish I could help more! I missed this comment until this very minute. I’ll have to check out the herb and onion AND the pasta e fagioli! Yum! Thanks for stopping by Joy!